Drummer Karriem Riggins speaks jazz and hip-hop, Betty Carter and Erykah Badu, Diana Krall and Kanye, performer and producer, rap and Burt Bacharach. 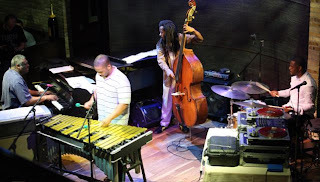 Most recently, one of his many projects, the Karriem Riggins Virtuoso Experience, brought straight-ahead jazz and hip-hop to the same stage on the same night. There’s no album yet, but one is in the works, and late June saw a brief tour, a let’s-see-how-it-flies run from the Triple Door in Seattle to Yoshi’s in Oakland to the Dakota in Minneapolis. Larry Englund and I caught Riggins and his group—the great Mulgrew Miller on acoustic piano and Fender-Rhodes, Warren Wolf on vibes, Joe Sanders on bass, and DJ Dummy on turntables—at the Dakota on Sunday, June 28. We weren’t sure what to expect. A fusion of jazz and hip-hop, à la G.U.R.U. or Branford Marsalis’s Buckshot LeFonque or Madlib’s work for Blue Note? Something entirely different? Where would Miller fit in? 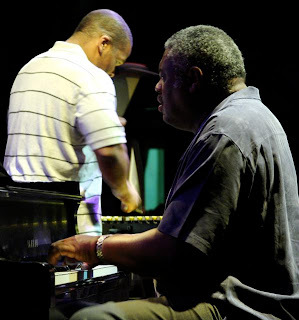 Riggins and Miller played together for years in Miller’s trio and made a series of recordings together, starting with Getting to Know You (1995) and continuing through the two Live at Yoshi’s releases on MaxJazz (2004/05). They trust and respect each other. And although (as we learned later) Miller may not be a hip-hop fan, he’s willing to join Riggins on his latest exploration. The Dakota show was eclectic and satisfying. DJ Dummy (real name Andrew Smith) opened with a solo set, a musical dance at the turntables lit by his ear-to-ear smile. He exited, the quartet entered, and it was straight-ahead time: a swinging version of Gene Perla’s “Tergiversation,” with Miller on Fender-Rhodes, and a jazzed-up take on Bacharach’s “Wives and Lovers” with Miller on acoustic piano. Wolf, a vibist new to these parts, was front-and-center on the stage, and the spotlight was his for much of the evening. At one point he played so fast and fierce that the head came off one of his mallets and flew into the crowd like a little cannonball. Fortunately it didn’t hit anyone; later in the set, it was retrieved and tossed back. Following Nicholas Payton’s “Let It Ride” (which ended with a terrific solo by Riggins), DJ Dummy returned, adding beats, toots, and whistles to a Brazilian tune. By now we had the answer to our question of what to expect: Not quite a fusion, but a whole of a different kind, sincere and musical. People who didn’t expect to like it—those who had come to hear Miller but were deeply suspicious of “that DJ thing”—ended up liking it a lot. After the show, Larry and I had the opportunity to interview Riggins and then Miller. Considering what a monster he is on drums, Riggins is surprisingly soft-spoken in conversation. Miller is a gentle giant. Both were generous with their time. Here are the highlights. Pamela Espeland: Thank you for a really interesting evening of music. It was different than I expected it to be—for some reason I thought it would be more hip-hop, and then we went from straight-ahead stuff to Burt Bacharach! Larry Englund: Burt Bacharach, the folks you’ve worked with—Elvin Jones, Tony Williams—What’s the common denominator for you? KR: For me, it’s just a lot of the music that I listen to daily. When I wake up, I have a wide range of different genres that I put on. A lot of my favorite songs. I put them together in a sequence that kind of takes you on a ride. PE: How much time do you spend doing that? KR: All day, really. That’s just what I do. Feeling music out, trying to get new inspiration, start something new, spark something new in me. PE: You started producing hip-hop in junior high? KR: Just experimenting. I didn’t really professionally start doing hip-hop until 1996, when I first bought my MPC 3000 [sampler/sequencer]. PE: Your father [Emmanuel Riggins] plays what kind of music? PE: So you were playing jazz with your dad? KR: I was rehearsing with him. PE: Did you have lessons as a child? KR: Not really. Just more going to see people play, just watching. That’s pretty much how I learned. Watching. PE: You’ve worked with [DJ Dummy] before? KR: With Kanye West, and also with Common. PE: The recording you’re making, are you working with Madlib? KR: I have two projects with Madlib. One is called Supreme Team, where we’re both rapping and producing. Then the jazz group—it’s not exactly jazz, but it’s a lot of soul, Brazilian, jazz fusion. It’s called the Jahari Masamba Unit. My jazz album I’m working on has Mulgrew Miller on piano, Warren Wolfe on vibes, and Robert Hurst on bass. It’s some of the music that we played tonight, and also some different. PE: So the Virtuoso Experience album you’re putting together now is not going to have a DJ on it? KR: I’m not going to say that yet. It’s not complete yet. LE: What made you decide that for this particular group you wanted to have vibes? KR: I love vibes. I love the Rhodes…. I love mellow-sounding instruments. Both have a mellow tone. That’s kind of like my personality, kind of mellow. LE: You’ve got piano and vibes, both of which have similar characteristics…. KR: And the Rhodes, definitely. PE: I hadn’t heard Warren Wolfe before tonight. I fell off my chair three or four times. KR: He’s a beast. Warren is a bad dude. PE: I think Stefon Harris was the last person I saw who moved that fast—although Stefon didn’t lose a head off his mallet. KR: Warren plays drums as well. PE: How did you and Mulgrew get together? KR: A bass player named Richie Goods introduced us. This was in 1994. We’ve been working together ever since then. LE: When you put together a group such as this group, where you have vibes—a very mellow instrument—and regular piano and electric piano, and a DJ, do you do it with a conscious concept in mind? KR: The conscious concept is the DJ can play any part. He can be a guitar, he can be the music—we’ve done duo things where it’s just a loop—he can be any instrument. PE: Does he do whatever he wants, or do you talk ahead of time about what you might want him to do, the kinds of sounds? KR: We pretty much have a setup—what we wanted to do tonight. PE: So, like the Latin percussion part…? KR: He plays the music, and he’ll juggle it, and I’ll play on top of it, basically kind of solo. LE: So you’re listening to him just as you listen to any other musician? LE: What’s been the most difficult part of putting this together for you, or has there been any difficulty? KR: These guys are so professional and musical it’s effortless working with them. It’s a beautiful thing. Superlative. LE: And when Mulgrew heard you were going to use a DJ, he was cool with that? Larry Englund: How did you hook up with Karriem? Mulgrew Miller: Karriem was the drummer in my trio for many years. From the time he was about 18…I think he was in my trio about 10–12 years. So we have a long history together. Pamela Espeland: How did you find him in the first place? MM: He had come to New York as a very young man, not quite out of high school, to be part of Betty Carter’s program, Jazz Ahead. You know how she would scout all these young people around the country. So he came there and he was kind of hanging out in New York, like all the youngsters do when they come to New York, and I heard about him through the bassist that was in my band at that time, Richie Goods, and I arranged a rehearsal where I could hear him and play with him, and I just fell in love with him right there, and it’s been a long relationship since then. He is a tremendous talent, I mean tremendous. There’s something in the water in Detroit…. 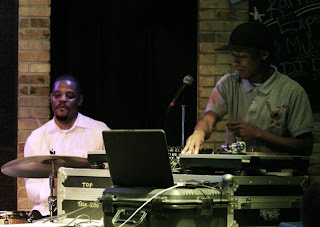 Some of the most naturally gifted musicians I know come out of Detroit. Kenny Garrett, a pianist named Johnny O’Neal…. Karriem falls right in there. He’s such a gifted young fellow. LE: In terms of your own career, when was it you decided this was something you were going to make a living at, or when did you realize that? MM (laughs): At first I wasn’t sure if I was going to make a living at it…. LE: That’s why I asked it that way. MM: The night that I decided this was something I wanted to do as a life, and lifestyle, was the night that I heard the great Oscar Peterson on The Joey Bishop Show. I was in ninth grade. Regis Philbin was the sidekick. Oscar Peterson came on. I’d been hearing about Oscar Peterson through my older brother. PE: Had you heard him play? Had you heard any of his recordings? MM: I had never heard him—nothing. I was into R&B at the time, and the closest thing to that I’d heard was Ramsey Lewis. You know, Ramsey had all those hits in the 60s, “Wade in the Water,” all these things, and I wasn’t prepared for what I was about to hear when I heard Oscar Peterson. It was like something from another planet for a young fellow like myself, having never heard that kind of jazz before, certainly not the piano played like that. So the next morning I was a different kid, let me tell you. PE: How old were you? PE: Did you ever have an opportunity to study with Oscar Peterson? MM: Oh, no. I wish I had. It was many years later before I met him. I’m from Greenwood, Mississippi, a little town in the delta of Mississippi, and I left there after high school and went through a couple years of college in Memphis, kind of moved around a bit before I ended up in New York playing. And then it was still some years later—I had met Oscar several times—before I had a chance to really sit down with him and conversate with him. It was the late 90s or something like that, or the early part of this century, the 2000s, something like that. PE: So you told him he changed your life? MM: I did tell him. I’m glad I had the chance to tell him. PE: You’re probably not the first person who told him that. MM: I can imagine. He touched so many…. But fortunately I got to know him a little bit, he heard me play a few times. The first time I knew that he was listening I couldn’t play a note. PE: There’s a piano player here [in Minneapolis], Tanner Taylor, 27 years old, and he says that Oscar Peterson is the reason he plays piano. LE: He’s developed a whole show around his music. MM: Oscar had that real accessible thing in his playing, where even though there’s a lot of technique and stuff going on, he had that swinging thing happening, and bluesy kind of thing that got you…. While I was at Memphis State University, I heard Phineas Newborn, and that knocked me out, and I heard McCoy Tyner during those years, and Chick Corea, and later Herbie [Hancock], then I got to New York and there was Tommy Flanagan, and Cedar Walton, and those kind of people I admire, and Kenny Barron…. PE: McCoy came through here not too long ago, and there were times tonight when I was thinking about McCoy when you were playing. MM: He was a huge inspiration. PE: We asked this of Karriem, too, but in a different way: Your recordings tend to be pretty straight-ahead jazz. How do you feel about this hip-hop stuff? PE: Do you listen to hip-hop? MM (pauses): No. I hear it, though. PE: You don’t necessarily seek it out, but you’re around it. MM: I have a daughter who’s 21. I hear it all. PE: There was more of a separation tonight than I think I was expecting coming in. LE: But when you used the hip-hop, it seemed to fit very well. MM: And this is a new project. As it goes on and evolves and develops, I think you’re going to see more of a marriage between them. PE: How far into it are you? How many times have you played together? MM: We’ve been on this little tour here about a week. PE: Did you rehearse with it, with a DJ? MM: We did some rehearsal. But, you know, it takes time…. For me, it’s a new concept. Karriem, he’s been out there hitting it. I think in his mind the concept is a lot further along than in my mind. So I’m sure he has a vision of where he wants to go with it. I know that he does. PE: You have such a long-term relationship that it’s also very logical that you’d be working together on this. MM: I’m honored that he asked me. I feel very close to him on a personal and a musical level. I’m just happy to be here. Larry Englund writes about music for The Villager in St. Paul, hosts the weekly “Rhythm & Grooves” radio show for KFAI, and hosts live shows at The Hat Trick Lounge in downtown St. Paul.